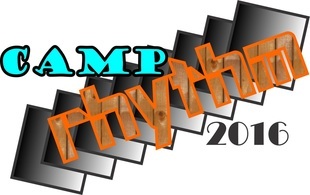 CAMP RHYTHM is a week-long program for young boys and girls that introduces them to the exciting world of rhythm expressed through tap dancing and music! It is an ideal program for any child that loves to make music, sing and dance! Our teaching philosophy is one of “Equal Footing,” in which students learn tap dancing and music fundamentals simultaneously. All lessons and activities are geared to promote the awareness and comprehension of the tap dancer as half-dancer/half-musician. Over the course of one week, students will engage in the study of tap dancing, singing, body percussion, basic applied music theory, improvisation and crafting homemade musical instruments. For three hours each day, students will participate in a variety of hands-(and feet)-on lessons and activities that will fine-tune ear-training, enhance movement and coordination skills, create a foundation of fundamental tap skills, develop singing skills in coordination with dancing, teach them to collaborate with their peers in an ensemble, and explore creative rhythmic expression improvisation and composition. Each day will begin with a group warm up to stimulate the ears, awaken the mind, and get the body moving! We will then move into group tap and music classes. There will also be focused independent time throughout the week as we build and create homemade musical instruments, and students can also look forward to meeting some of our tap and jazz heroes through presentations and videos! Classes will be led by Artistic Director, Heidi Malnar, an assistant company member, and special guest teacher Theatre on Tap's Music Director, Ainsley Matich! By the end of the week, students will have transformed into young rhythm masters! The week will culminate in a public showcase for friends and family to share the skills, knowledge and experience they have gained over the course of the week. They will be inspired by all that they have accomplished in only one week, and we know you will too! *Registration form must be sent along with registration prior to first day of camp. ﻿*All students must provide their own tap shoes with a proper fit. Shoes should fit snug, but not be too uncomfortable. Loose shoes are not safe to dance in. *Please provide socks that fit comfortably with their shoes. *Please wear comfortable clothing with ankle visibility!